A new Princess 88 has been sold by Moran Yacht & Ship and Princess Yachts America and has been delivered to her U.S.-based owner. Often described as a pocket superyacht, the Princess 88 measures 26.82 metres and, depending on the engine options selected, can reach up to 30 knots. One of the standout features of her naval architecture, by Olesinski, is her deep-V hull. And it was the top deck of the Princess 88 that wowed when she was first launched, due to her opening roof that mirrors the sophistication of the Princess 40M. Her elongated flybridge features a spa pool and plenty of space for alfresco living, with sunken seating forward and plenty of sunpads. Other notable features of her exterior design include a focus on increased volume and a drop-down balcony. Built by Princess Yachts America, this Princess 88 differs to the models built elsewhere in the world as she complies with the regulations of the U.S. Coast Guard’s Office of Boating Safety. She also complies with recommendations by the ABYC. This particular Princess 88 has accommodation for eight guests in four suites. No other details are known about her interior. 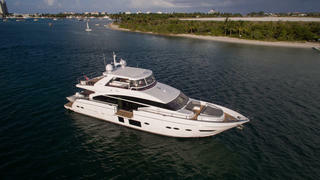 The Princess 88 was sold by Moran Yacht & Ship and Princess Yachts America and her asking price is unknown.